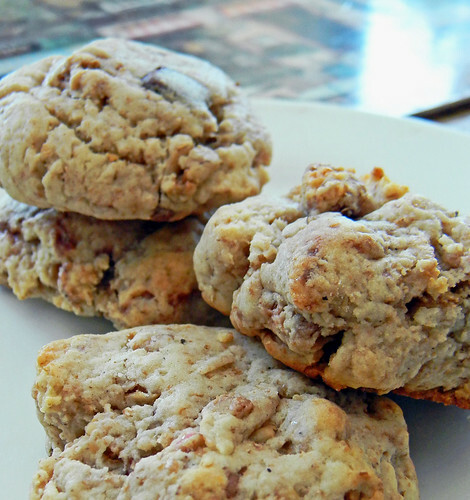 Sourdough Chunk Cookies #SundaySupper Picnic! | What Smells So Good? Happy Sunday! I'm personally astonished that it's almost the end of April now... where has the time gone? All of a sudden the snow has melted away and even a good portion of the mud "ponds" have dried up into mere puddles, and when the forecast calls for precipitation it's no longer centimetres of "white stuff" but millimetres of rain. Married with the beginnings of new grass growth in the backyard, this year's crop of tomato seedlings starting to sprout indoors and small bouquets of cut daffodils for Cancer Awareness available in the stores, there's no doubt in my mind that it is, finally, Spring. One of the major Spring projects my community, as well as my family, takes part in is an outdoor clean-up for Earth Day. It's a time for us to pick up and properly discard all the littler that had been hidden underneath the snow over the winter so that any toxins won't poison the soil and water supply. Depending on the day and who runs the city's version of the event, an eco-friendly lunch follows which always sends people home just that little bit more aware of their ecological impact. I've always been one to try and reduce waste in the kitchen, more out of a desire to save money than anything else, so the idea of making a pack-along dessert for on-the-go noshing that required no extra shopping on my part was right up my alley. I have been nursing a sourdough starter for many years now, and always have sourdough toss-off on my hands. I do my best to use it in whatever I can, from a supplement in bread to an ingredient in hot cross buns, crumpets and even brownies, but I'll admit I still wind up tossing more than my fair share into the compost bin. Then, I found the perfect solution - cookies that allowed me to use up my excess sourdough quickly (no "1/4 cup" amounts here) and stock my freezer with "bake-on-demand" treats for whenever the moment strikes! The rye-based starter I use guarantees the baked cookies are tender, with a delicate but definite "tang" that works perfectly with almost any addition you can think of - I compiled a host of leftover Valentine's Day and Easter dark chocolate from this year's gift stash and bulked up the rest of the batter with the last of a bag of Love Crunch® Dark Chocolate & Red Berries, which I had received for review in December. Everything else was pantry- and fridge-raided too, and the whole compilation was so successful that I wound up making a second batch to use up all the tiny boxes of Valentine's Day Smarties I had been given and taking it into school for bake sale. This week at #SundaySupper we're celebrating a two-fer of special days. April 22nd is Earth Day and April 23rd is National Picnic Day - perfectly inter-laceable themes with an eye towards appreciating our planet. In homage to the theme, our group (led by by T.R. of Gluten Free Crumbley) is sharing recipes perfect for picnicking or otherwise enjoying in the great outdoors. Beat together shortening, sugar, Truvia and egg until fluffy. Beat in the egg, then stream in the butter and beat thoroughly. Add the vanilla, nutmeg and salt, beating well. Add the flours, baking powder and baking soda, mixing to combine without beating. Fold in chocolate and granola. Scoop tablespoons of dough onto lined cookie sheets, flattening slightly. Cover lightly and chill 1 hour. Cool on the sheet for 5 minutes, them move to a wire rack and cool completely.